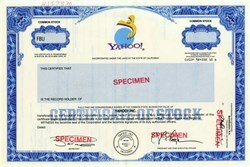 Beautiful engraved specimen certificate from the Yahoo incorporated . This historic document was printed by American Bank Note Company and has an ornate border around it with a vignette of the company logo. This item has the printed signatures of the Company's President/CEO (Jerry Yang) and Secretary . Yahoo! Inc. is a global Internet communications, commerce and media company that offers a comprehensive branded network of services to more than 192 million individuals each month worldwide. As the first online navigational guide to the Web, www.yahoo.com is the leading guide in terms of traffic, advertising, household and business user reach. Yahoo! is the No. 1 Internet brand globally and reaches the largest audience worldwide. The company also provides online business and enterprise services designed to enhance the productivity and Web presence of Yahoo! 's clients. These services include Corporate Yahoo!, a popular customized enterprise portal solution; audio and video streaming; store hosting and management; and Web site tools and services. The company's global Web network includes 24 World properties. Yahoo! has offices in Europe, the Asia Pacific, Latin America, Canada and the United States, and is headquartered in Santa Clara, Calif.
Like many other aspects of the computer age, Yahoo! began as an idea, grew into a hobby and lately has turned into a full-time passion. The two developers of Yahoo!, David Filo and Jerry Yang, Ph.D. candidates in Electrical Engineering at Stanford University, started their guide in April 1994 as a way to keep track of their personal interests on the Internet. Before long they found that their home-brewed lists were becoming too long and unwieldy. Gradually they began to spend more and more time on Yahoo!. In early 1995 Marc Andreessen, co-founder of Netscape Communications in Mountain View, Ca., invited Filo and Yang to move their files over to larger computers housed at Netscape. As a result Stanford's computer network returned to normal, and both parties benefited. Today, Yahoo! contains organized information on tens of thousands of computers linked to the Web. The San Jose Mercury news recently noted that "Yahoo is closest in spirit to the work of Linnaeus, the 18th century botanist whose classification system organized the natural world." In January 1994, Jerry Yang and David Filo were Electrical Engineering graduate students at Stanford University. In April 1994, "Jerry's Guide to the World Wide Web" was renamed "Yahoo!". Filo and Yang said they selected the name because they liked the word's general definition, which comes from Gulliver's Travels by Jonathan Swift: "rude, unsophisticated, uncouth." Its URL was akebono.stanford.edu/yahoo. By the end of 1994, Yahoo! had already received one million hits. The Yahoo! domain was created on January 18, 1995. Yang and Filo realized their website had massive business potential, and on March 1, 1995, Yahoo! was incorporated. On April 5, 1995, Sequoia Capital provided Yahoo! with two rounds of venture capital. 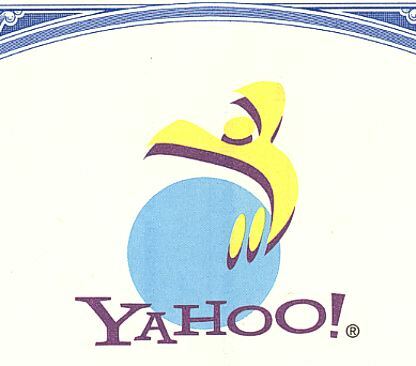 On April 12, 1996, Yahoo! had its initial public offering, raising $33.8 million dollars, by selling 2.6 million shares at $13 each. "Yahoo" had already been trademarked for barbecue sauce (and knives (by EBSCO Industries). Therefore, in order to get the trademark, Yang and Filo added the exclamation mark to the name.